Hi, everyone! Need to give a gift for your best friend, mom or sister? I’ve got an idea for you. Make her a set of Clean And Simple (CAS) style cards so she can send notes to her loved ones. It’s easy to make a set of cards with a modern feel and a bit of glitz with products from Scrapbook Adhesives by 3L. Making It Clean And Simple! The first thing you need to do is determine how many cards you want your set to have. Cut enough card bases for your cards. Then cut a word panel for each one. Adhere the word panels to the cards. When adhering small words to cards, I like to use the E-Z Dots Permanent Dispenser. I love this adhesive because you can roll it over the back of your words. When you place a word on your project, you can use your finger to easily rub off any stray adhesive that gets onto it. If your words have any “o” letters in them, place a foam circle in the middle of them. Remove the sticker paper and apply some foil on top. Use your finger or a bone folder to do the burnishing. Now, you are going to want to add some lines to your cards. 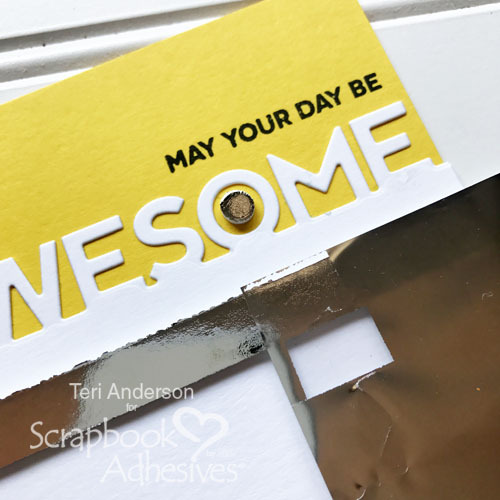 Adhere a piece of Crafty Foam Tape to each card. I recommend letting a little foam tape hang off the side of each card and then using your scissors to snip it off. Remove the tape’s backing paper and burnish some foil onto it. Don’t fret if your foil doesn’t cover the entire piece of tape. Just come back and set the foil down again and burnish some additional foil on the still exposed areas of the tape. You are now going to add one more line to each card. 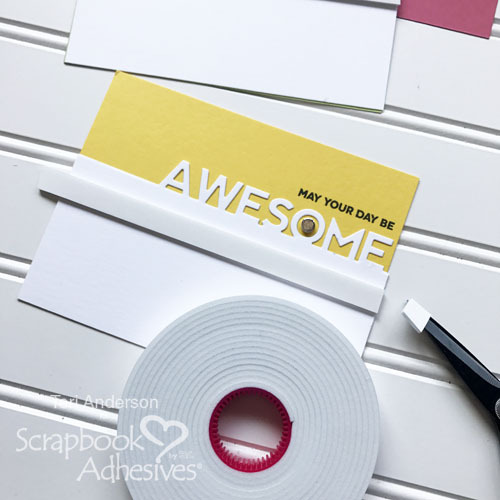 This time you want to add a line of Extreme Double-Sided Tape right below the Crafty Foam Tape. Once again, I recommend letting a little bit of tape hang off the sides of your cards and using your scissors to snip off the excess. Remove the tape’s backing paper and apply flock to it. (Don’t have any flock? Consider using glitter instead!) Repeat this step with each card! Once you’ve completed your cards, bundle them with some envelopes. Either place them in a pretty box or bag (or tie some ribbon or string around them) and give them to the lucky recipient! I hope you enjoyed this Clean and Simple Style tutorial! If you are inspired to make a card set of your own, please share it with me by leaving a comment with a link to it. This entry was posted in 3D Foam Circles, Adhesives, Beginner, Cards, Crafts & Tutorials, Crafty Foam Tape, E-Z Runner® Dispensers, Gifts, HomeHobby by 3L, Metallic Transfer Foil, Permanent Adhesive, Skill Level, Tutorial, Wear your Adhesive on the Outside and tagged 3D Foam Circles White Mix, 3D Foam Creative Embellishment Kit with Foil, CAS, Craft Foil, Crafty Foam Tape White, E-Z Dots Permanent, E-Z Dots Permanent Refill, E-Z Dots Permanent Refillable, Extreme Double-Sided Tape 1/4", Flock, Foil, Glitter, Metallic Transfer Foil Holographic, Stampendous, Studio Calico, Teri Anderson. Bookmark the permalink. 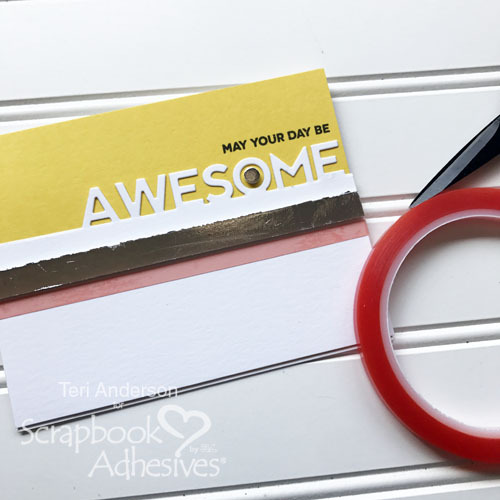 One Response to "Modern Clean And Simple (CAS) Style Card Set Tutorial"
Teri, these are adorable! 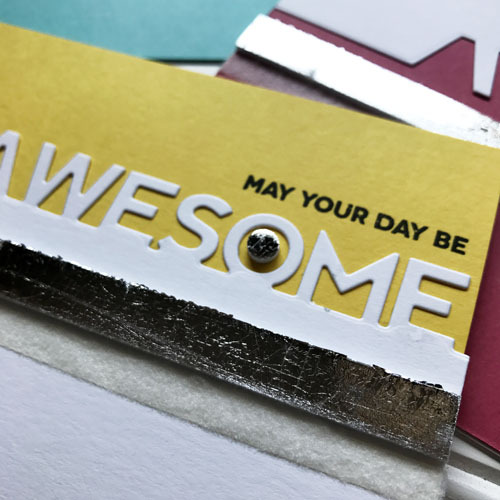 What a nice gift it would be to give a set of awesome cards to someone special! Thanks for sharing! And these are my favorite ever adhesives!! !